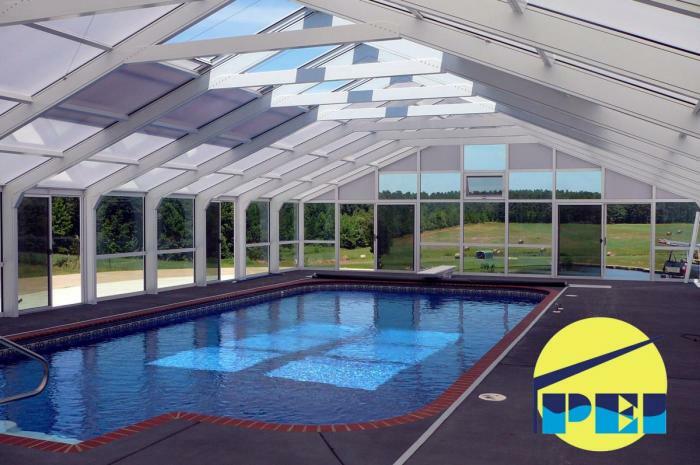 BELOW ARE PHOTOS OF A 37' X 67' FREESTANDING POOL ENCLOSURE CONSTRUCTED IN N.E. MISSISSIPPI. 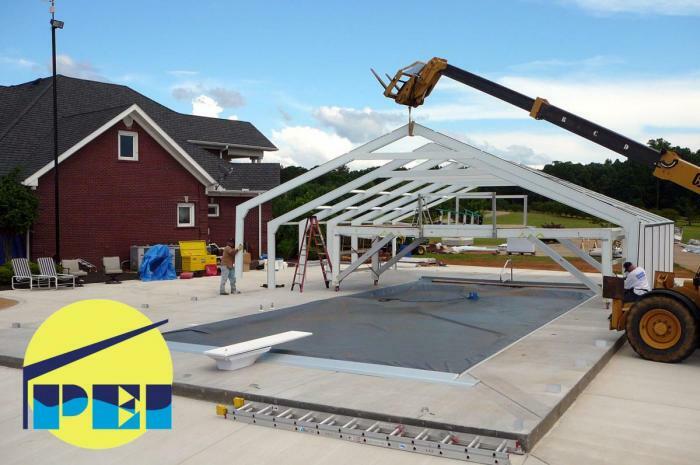 A 20' x 40' salt water vinyl lined pool was installed, including a 12" wide continuous foundation wall (grade beam) monolithically poured flush to the top/outer edge of the concrete deck. 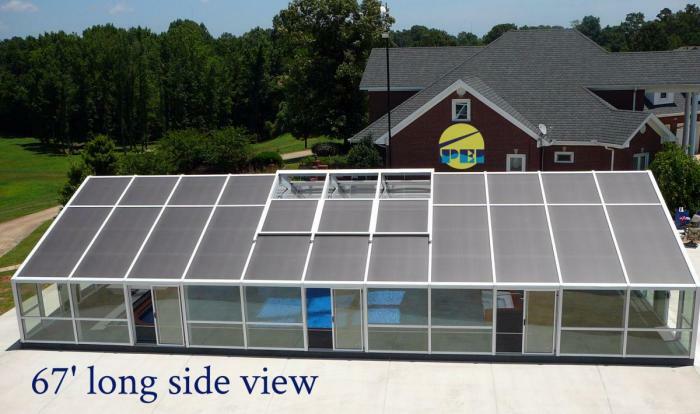 Also shown is a motorized pool cover that will keep the pool temperature constant, save chemical costs and more importantly will control the indoor humidity during cold weather months. Day 3 of installation. Setting assembled rafter/columns over anchored base channels. 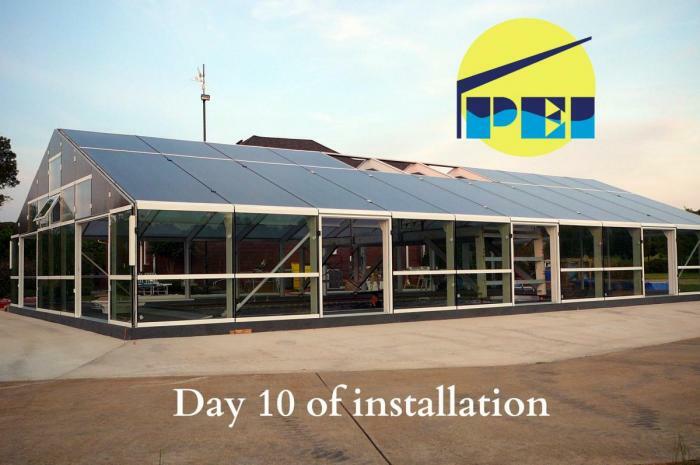 10th day of installation. All glazing of glass walls and polycarbonate roof installed with temporary caps. Completion after 15 (12 hour) days. 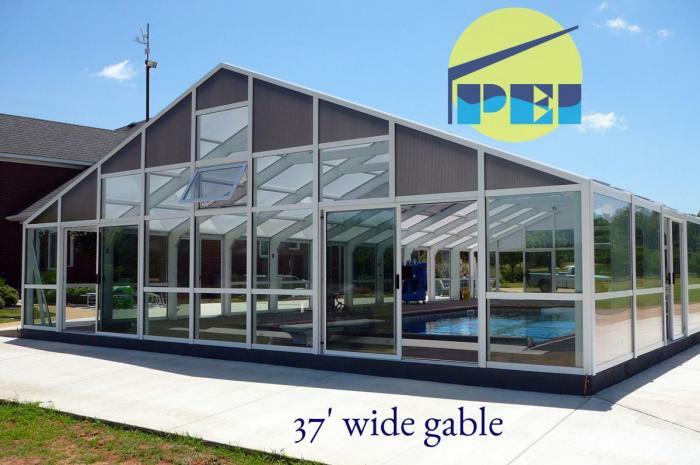 Below is a gable end view with (1) 4' x 4' awning window, (2) 8' wide x 6'-8" tall sliding glass doors, 1" tempered insulated low-e glass walls and 25mm bronze over opal 5-wall polycarbonate upper gable glazing. Interior view with (3) 6' x 6' motorized retracting roof panels. 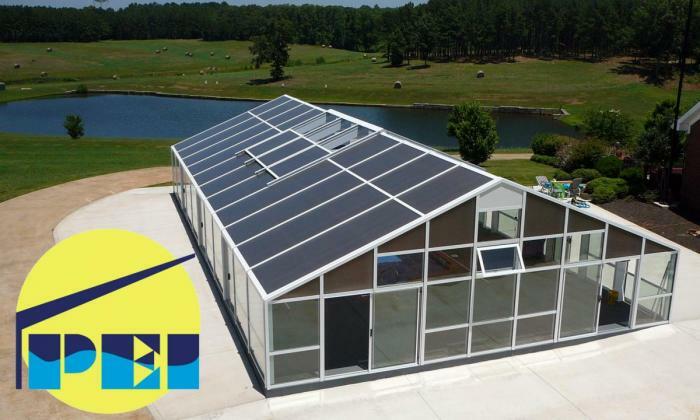 Note the interior opal color of the bi-color multiwall polycarbonate roof glazing. Opposite gable end below, with a solid aluminum faced foam-core panel located near the ridge for venting a future hanging gas heater. PEI offers stainless steel gas heaters with stainless steel heat exchangers and burners. Side view with (3) 6' wide x 6'-8" tall sliding glass doors with screens. The roof glazing is 25mm (1") 5-wall bronze over oval athermic polycarbonate.